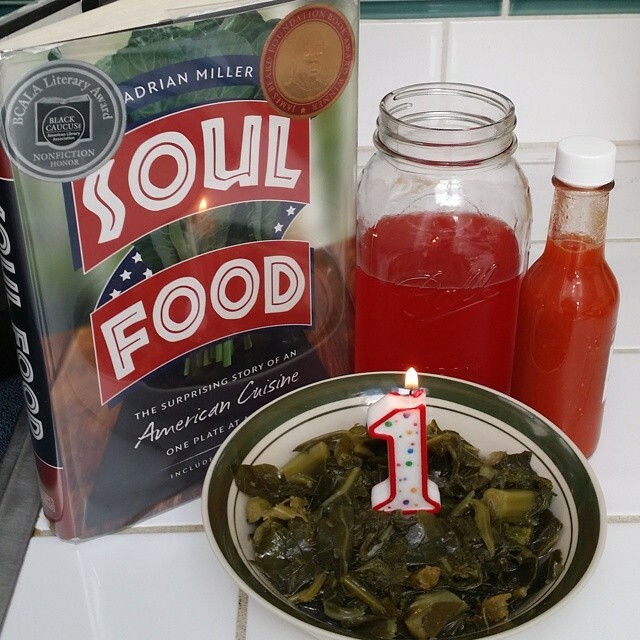 Adrian E. Miller – Soul Food Scholar » Happy First Year Birthday, Soul Food! Happy First Year Birthday, Soul Food! Today, Soul Food: The Surprising Story of an American Cuisine celebrates its one year birthday! It has been quite a year since August 15, 2013. Soul Food got off to a great start by selling out its first printing . . . before it was officially published! It’s been fortunate to be on its third printing at the time of this post. Soul Food has taken me around the country to spread the good word on this incredible cuisine, and I look forward to continue doing so because the speaking requests and presentation opportunities keep rolling in. My baby even won a few beauty contests, most notably, the 2014 James Beard Foundation Book Award for Reference and Scholarship and being named a 2013 Black Caucus of the American Library Association Nonfiction Honor Award. All of this wouldn’t have been possible without YOU. Thanks to all of you who read the book, spread the word about my book and continue to support my culinary and literary adventures. I’m eternally grateful to you, and as I wrote in Soul Food‘s premise, my jar of bacon grease on the back of the stove runneth over.